Wash the pork shoulder. In a mixing bowl combine the rest of the ingredients. With a sharp knife make incisions in different place of the pork shoulder. Put the mixture in the incisions and rub the marinate over the pork. Refrigerate over night. Let it rest for 2 hours before putting it in the oven. 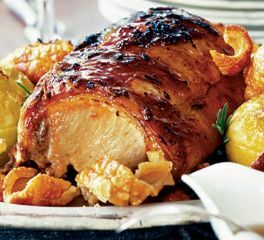 If you planned to cook it the same day, prepare the pork at least 1 hour ahead of time and then cook it in the oven. Turn the oven 10 minutes before you place the pork shoulder in the oven and set the temperature to 350ºF. Cook the pork for 3 1/2 hours covered. Then uncovered the pork and raise the temperature to 375ºF and cook for 15 to 30 minutes until the skin is toasted.